May 2007 – Page 2 – überthings, inc.
Cam puts together a super simple lat/long findery tool. Very useful. A response to danah’s Twitter curiosity. First, the practical question. Can i quote you? [x] Yes, and you *must* use my real name. I use Twitter extremely infrequently to jot down my thoughts and occasionally describe what I’m doing or about to be doing. I like the immediacy of being able to send texts that are then archived elsewhere. About 14 friends and 4 randoms. The audience I want is vast, terribly interesting and extremely global, but they just don’t seem to want to read my tweets. Why? Probably because the volume and subject matter of the Tweets I produce is insignificant to derive any real value from unless you’re a closeish friend. Or more realistically, not even if you’re close friend. Related to my audience – I’m uncertain why some of my “audience” (SusanBratton, Paul Terry Walhus) subscribed. I used to read others’ Tweets back in the glory days when Twitter was populated by 2000 geeks and a pet pooch. I definitely do not read them all and part of the reason for that is sheer signal to noise ratio. There are some people I follow that publish far too much for me to ever keep up with them on a regular basis. What is considered Tweet-safe content varies tremendously from person to person. In my own experience, friends that keep their tweets private publish the most risque / inappropriate Tweets. I find most things are safe for broadcasting, but I draw the line at bodily functions, regular food updates and questions about coffee. I’ve found myself wanting to Tweet a few times, composed the message, then left it unsent in my drafts folder. Once or twice I’ve composed a Tweet, thrown it into the drafts folder and then published it a day or two later. What that says about my issues with immediacy and self-censorship… I’m not quite sure yet. My Tweets are public. I find that since I use it more as an immediate blogging tool rather than an unmoderated stream of consciousness log, I have no problem with people I don’t know coming across it. Since I’ve been publishing Tweets and blog posts with approximately the same frequency and subject matter, I don’t feel like this is a problem personally. I would worry about this more if I was looking for a job and my Tweets contained more personal subject matter, but honestly, it’s the same issues I would have to deal with if I started publishing more personal blog posts. Twitter is vaguely working for my friends. The dynamics seem to be like that of a group mailing list – a handful of people account for most of the traffic with vastly lower frequency from everyone else. It’s definitely improved a hell of a lot in the last few months, and by improved, I mean I had to switch to Twitterific-only mode because my phone was getting too many txts. Townsend’s swansong for Dodgeball is simultaneously poignant and true. 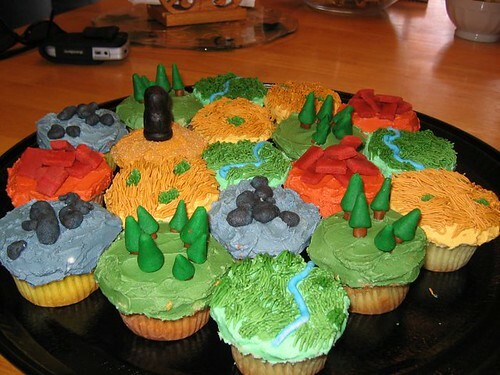 Settlers of CaKEtan!, originally uploaded by Queen of Cake. Landtastic! Catanicious! This will finally unite the worlds of cupcake and gaming geeks and bring lasting peace and delicious tasting treats to all. Hahahahha. Awesomely snarky commentary from a new brit celeb blog. One of the great tragedies of modern computer science turns out to have such a simple, prosaic explanation.